And with classic good looks, it's party-perfect! Go with metal for keeping bubbly brisk. Steel naturally retains coldness when ice is added, keeping your Champagne crisp longer. And with classic good looks, it's party-perfect! Loop handles make carrying easy. Use for chilling white wine, too. One gallon. Is it stainless steel and what grade if it is? BEST ANSWER: The grade is not available, however, this bucket is definitely stainless steel. BEST ANSWER: Yes it will sweat. Can you engrave this for me and if so what is the cost? BEST ANSWER: The Stainless Champagne Bucket can not be engraved, we only offer it without the engraving. 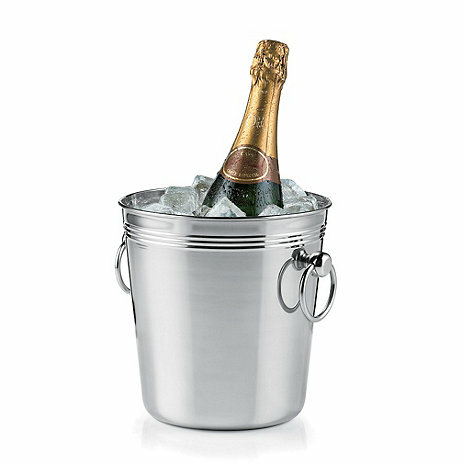 Good looking and perfectly sized bucket for chilling champagne and white wines.